Thailand zeichnet sich durch niedrige Lebenshaltungskosten bei gleichzeitig hoher Lebensqualität aus. Für Chiang Mai trifft dies ganz besonders zu, wie sich in unserem Ratgeber "Thailand Auswandern. Ja, aber richtig!" zeigt. 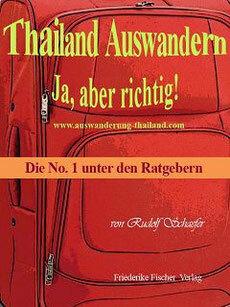 Gewinnen Sie im Buch einen Überblick über verschiedenste Preise in Thailand. Finden Sie dort auch Erfahrungsberichte anderer Auswanderer hinsichtlich deren monatlich benötigten Budgets. Gewinnen Sie selbst dadurch ein realistisches Gefühl dafür, welches persönliches Budget Sie voraussichtlich benötigen werden..
Im Ratgeber "Thailand Auswandern. Ja, aber richtig!" erhalten Sie außerdem Infos über Mietkosten, Energiekosten, Preise für Gebrauchtfahrzeuge, Kosten für Internet, Kosten und Voraussetzungen für den Erwerb des thailändischen Führerscheines, Infos über Versicherungen (Krankenversicherung, Fahrzeugversicherung), Visakosten und -regularien u. v. a. m.
Es werden Ihnen außerdem Tipps gegeben, wie Sie "Ihre Lebenshaltungskosten" sinnvoll reduzieren könnten und darauf hingewiesen, wo es eventuell weniger sinnvoll ist, Kosten sparen zu wollen. Gerade für jene Auswanderer, die nicht ausschließlich von Einkünften aus der alten Heimat leben können und beispielsweise beabsichtigen in Thailand ein Geschäft zu gründen, sind diese Rahmendaten besonders wichtig. Auch Rentner und Pensionäre bleiben von diesen "Rahmenbedingungen" freilich nicht gänzlich unberührt. Dort können Sie ganz konkret die Preise verschiedener Güter und Dienstleistungen ermitteln. Besonders interessant ist hierbei, dass außerdem die jeweiligen Preise verschiedener Städte Thailands miteinander vergleichen werden können. Auf diese Weise können Sie sich einen sehr konkreten Einblick hinsichtlich der Lebenshaltungskosten in Thailand verschaffen. Wichtige aktuelle wirtschaftlichen Rahmendaten Thailands, wie etwa die aktuelle Inflationsrate (inflation rate), der CPI (consumer price index = Verbraucherpreisindex), Handelsbilanz (trade of balance) u. v. a. m.
Standard & Poor's credit rating for Thailand stands at BBB+ with stable outlook. Moody's credit rating for Thailand was last set at Baa1 with stable outlook. Fitch's credit rating for Thailand was last reported at BBB+ with stable outlook. In general, a credit rating is used by sovereign wealth funds, pension funds and other investors to gauge the credit worthiness of Thailand thus having a big impact on the country's borrowing costs. This page includes the government debt credit rating for Thailand as reported by major credit rating agencies. Thailand Three Month Interbank Rate was quoted at 1.88 percent on Friday April 19. Interbank Rate in Thailand averaged 2.61 percent from 2005 until 2019, reaching an all time high of 5.41 percent in July of 2006 and a record low of 1.35 percent in January of 2010. The interbank rate is the rate of interest charged on short-term loans made between banks in the local currency. This page provides - Thailand Interbank Rate- actual values, historical data, forecast, chart, statistics, economic calendar and news. Industrial Production in Thailand decreased 1.60 percent in February of 2019 over the same month in the previous year. Industrial Production in Thailand averaged 6.83 percent from 1988 until 2019, reaching an all time high of 59.60 percent in November of 2012 and a record low of -32.50 percent in November of 2011. In Thailand, industrial production measures the output of businesses integrated in manufacturing sector of the economy. This page provides the latest reported value for - Thailand Industrial Production - plus previous releases, historical high and low, short-term forecast and long-term prediction, economic calendar, survey consensus and news. Imports in Thailand decreased to 17519.24 USD Million in February from 23026.28 USD Million in January of 2019. Imports in Thailand averaged 10594.94 USD Million from 1991 until 2019, reaching an all time high of 24937.81 USD Million in March of 2012 and a record low of 2760 USD Million in February of 1992. Thailand imports mainly raw materials and intermediate goods (around 56 percent of total imports). Fuel accounts for 19 percent, parts of electronic appliances for 11 percent, materials of base metal for 9 percent, and chemicals for 5.5 percent. Machinery, equipment and supplies such as computers and mechanical represent 25 percent of total imports, and consumer goods account for 8 percent. Main import partners are Japan (20 percent of total imports), China (15 percent) and the European Union (8 percent). Others include the United Arab Emirates, Malaysia and the United States. This page provides the latest reported value for - Thailand Imports - plus previous releases, historical high and low, short-term forecast and long-term prediction, economic calendar, survey consensus and news. Exports in Thailand increased to 21553.66 USD Million in February from 18993.92 USD Million in January of 2019. Exports in Thailand averaged 10627.04 USD Million from 1991 until 2019, reaching an all time high of 22794.45 USD Million in August of 2018 and a record low of 1997 USD Million in February of 1991. Thailand is an export oriented economy with exports accounting for around 65 percent of the GDP. The country mainly exports manufactured goods (86 percent of total shipments) with electronics (14 percent, vehicles (13 percent), machinery and equipment (7.5 percent) and foodstuffs (7.5 percent) being the most important. Agricultural goods, mainly rice and rubber, account for 8 percent of total shipments. Major export partners are China (12 percent), Japan (10 percent), the United States (10 percent) and the European Union (9.5 percent). Others include: Malaysia, Australia and Singapore. This page provides - Thailand Exports - actual values, historical data, forecast, chart, statistics, economic calendar and news. Thailand recorded a trade surplus of 4030 USD Million in February of 2019. Balance of Trade in Thailand averaged 32.09 USD Million from 1991 until 2019, reaching an all time high of 4974.14 USD Million in February of 2016 and a record low of -5916.16 USD Million in January of 2013. As an export oriented country, Thailand is highly exposed to external economic shocks, which lower demand for Thai products, thus affecting the trade balance. Thailand major exports are electronics, vehicles, machinery and equipment. The country mainly imports fuel, electronic and machinery appliances. Main trading partner are Japan (10 percent of total exports and 20 percent of total imports) and China (12 percent of total exports and 15 percent of total imports). Others include: the European Union, the United States and Malaysia. This page provides the latest reported value for - Thailand Balance of Trade - plus previous releases, historical high and low, short-term forecast and long-term prediction, economic calendar, survey consensus and news. Banks Balance Sheet in Thailand increased to 19154384 THB Million in February from 19061968 THB Million in January of 2019. Banks Balance Sheet in Thailand averaged 17265057.03 THB Million from 2013 until 2019, reaching an all time high of 19154384 THB Million in February of 2019 and a record low of 14874369 THB Million in January of 2013. This page provides - Thailand Banks Balance Sheet - actual values, historical data, forecast, chart, statistics, economic calendar and news. Bank Lending Rate in Thailand remained unchanged at 7 percent in March from 7 percent in February of 2019. Bank Lending Rate in Thailand averaged 9.31 percent from 1989 until 2019, reaching an all time high of 16.50 percent in December of 1990 and a record low of 5.75 percent in January of 2005. In Thailand, the Minimum Overdraft Rate is the minimum rate of interest charged on overdrafts by commercial banks to private individuals and companies. This page provides - Thailand Prime Lending Rate - actual values, historical data, forecast, chart, statistics, economic calendar and news. Loans to Private Sector in Thailand increased to 4167360 THB Million in February from 4141049 THB Million in January of 2019. Loans to Private Sector in Thailand averaged 2679099.64 THB Million from 2000 until 2019, reaching an all time high of 4181406 THB Million in December of 2018 and a record low of 1701089 THB Million in December of 2001. This page provides - Thailand Loans to Private Sector - actual values, historical data, forecast, chart, statistics, economic calendar and news. The inflation rate in Thailand was recorded at 1.24 percent in March of 2019. Inflation Rate in Thailand averaged 4.11 percent from 1977 until 2019, reaching an all time high of 24.56 percent in June of 1980 and a record low of -4.38 percent in July of 2009. In Thailand, the most important categories in the consumer price index are Food and non-alcoholic beverages (36 percent of total weight), Transportation and communication (24 percent) and Housing and furnishing (23 percent). Others include: Medical and personal care (6 percent); Recreation and education (6 percent); Apparel and footwear (3 percent); and Tobacco and alcoholic beverages (1 percent). This page provides the latest reported value for - Thailand Inflation Rate - plus previous releases, historical high and low, short-term forecast and long-term prediction, economic calendar, survey consensus and news. Die aktuellen Bezinpreise im Lande wirken sich entscheidend auf die Lebenshaltungskosten in Thailand aus. Mit der folgenden Übersicht bleiben Sie auf dem Laufenden, was die tagesaktuellen Benzinpreise anbelangt.